ROYAL CANIN Chihuahua Adult Wet Dog Food is both scrummy and nutritious! Loaf is designed to help support your dog’s healthy internal transit. It also contains nutrients that help to provide the nourishment needed to maintain the good health of a Chihuahua’s skin and coat. 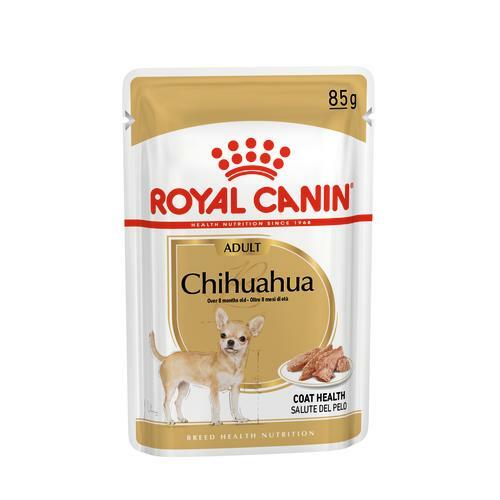 ROYAL CANIN Chihuahua in Loaf is formulated with an adapted texture to increase palatability to satisfy the appetite of even the fussiest of Chihuahuas! The soft texture of the loaf is also ideal for the jaws of a miniature breed – such as the Chihuahua – to help ease chewing and support optimal consumption and digestion. To cater to each dog’s individual preferences, ROYAL CANIN Chihuahua in Loaf is also available as dry food, with crunchy and tasty kibble. If you’re considering mixed feeding, simply follow our feeding guidelines to ensure your dog gets an accurate amount of both wet and dry food for optimal benefit. Coat health - Contains nutrients to nourish the Chihuahua’s skin and coat. Healthy transit - Helps support a healthy transit. Appetite stimulation - Helps satisfy the Chihuahua’s appetite. Additives: Vitamin D3: 200 IU, E1 (Iron): 8 mg, E2 (Iodine): 0.2 mg, E4 (Copper): 1.9 mg, E5 (Manganese): 2.6 mg, E6 (Zinc): 26 mg - Technological additives: Clinoptilolite of sedimentary origin: 2 g.
Composition: Meat and animal derivatives, derivatives of vegetable origin, cereals, oils and fats, minerals, various sugars. Crude ash: 2.1%. Crude fibre: 1.4%. Crude oil fats: 5.6%. Moisture: 79%. Protein: 8.5%.